(7) The basic components that should be taken into account when calculating the stiffness of a welded beam-to-column connection and a bolted angle flange cleat are given in Table 6.9. Similarly, the basic components for a bolted end-plate connection and a base plate are given in Table 6.10. In both of these tables the stiffness coefficients, X, ,for the basic components are defined in Table 6.11. (8) For beam-to-column end plate joints the following procedure should be used for obtaining the joint stiffness. 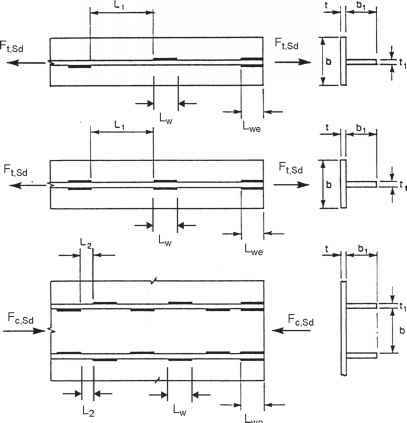 The equivalent stiffness coefficient, keii, and the equivalent lever arm, zeii, of the connection should be obtained from 6.3.3. The stiffness of the joint should then be obtained from 6.3.1(4) based on the stiffness coefficients, keq (for the connection), kt (for the column web in shear), and with the lever arm, z, taken equal to the equivalent lever arm of the connection, zeii.